Ashlea Mews Care Home was recently visited by Virtual Reminiscence providers, ‘Reminiscience’. 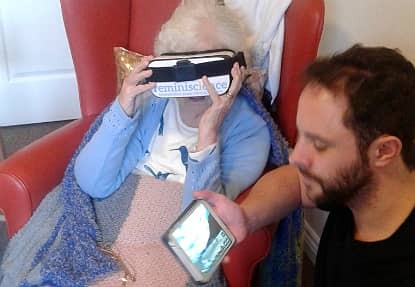 This may sound like some kind of space age technology but Reminiscience offer virtual reminiscence sessions for care homes up and down the country and they recently visited another one of our homes, Cherry Trees. Using a virtual tour of old South Shields and Marsden Bay, residents felt as though they had travelled back in time, as they immersed themselves in the memorable and historic landscape. “We specialise in person led virtual reality experiences. We have been delivering our activity to Ashley Mews for a couple of years now and the results we get have always been amazing. Showing resident’s places they are unable to visit anymore, triggers happy memories and experiences which always bring a smile to their face.” Commented Jack, who delivered the VR experience. Residents Margaret and Lena were completely fascinated with the VR experience. “I used to live in Marsden and can remember Marsden rock very well, it was great to feel like I was going back to when I was younger”, said Margaret. “It’s very realistic, it’s like I’m really there. Look at the beautiful beach and all the dogs. It’s lovely”, added Lena. The session was a huge hit amongst all of the residents and naturally sparked a lot of conversation amongst everybody. Families who visited the home even got involved and said it was an enjoyable experience, seeing their hometown as their family members remembered it all those years ago.